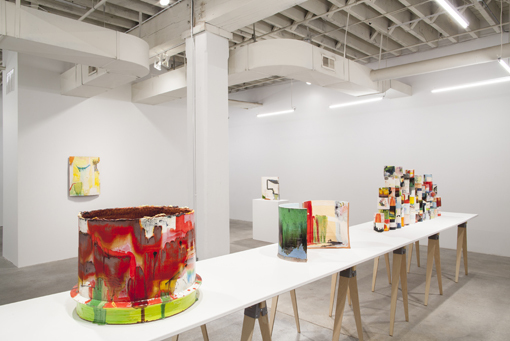 On elemental, stout ceramic cylinders and planes, Lauren Mabry builds a riot of color and timbre of magnetic dissonance. Her works capture space with a particular authority, yet together form not so much a wall of sound as a dynamic layering of distinct voices. For Mabry, the ceramic form is a sculptural support for highly expressive, yet versatile painting. In this exhibition, her sculptures are granted an even field, arranged on a single long table or hung on the wall in a manner that that amplifies their distinctions. Here the searing, aggressive palette of Cracked Cylinder is countered by the verdant, open gestural invitation of Split Open Cylinder. The works' differences of palette, the grain of their marks, opacity of the underglaze, or simply the density of the color field provide tonal qualities that form shimmering personality within each work. 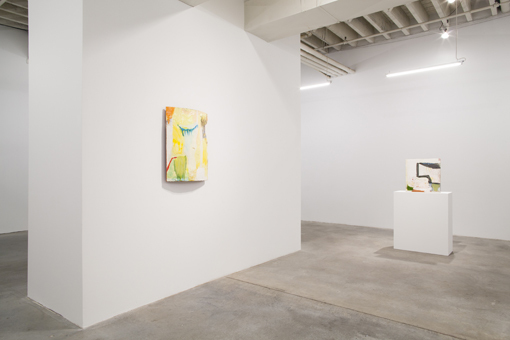 Similar to Betty Woodman, whose work brought the concerns of painting and sculpture to the living history of the vessel, Mabry's work exudes a respect for traditions of the medium offset by a will to experiment. 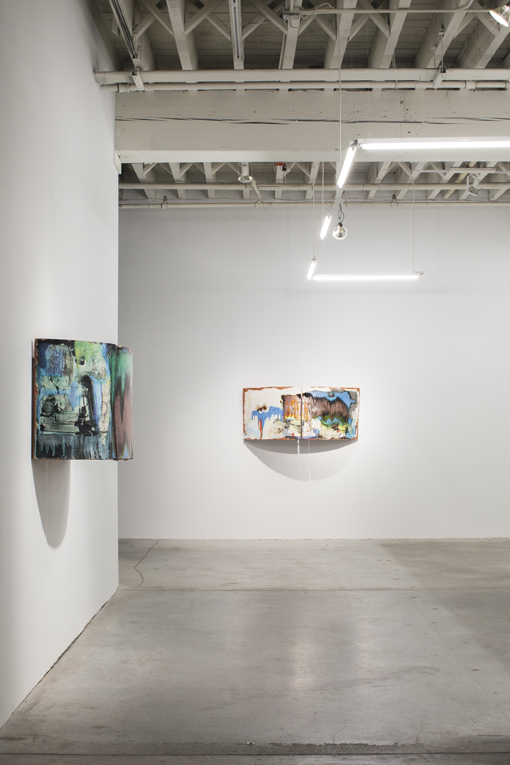 Yet Mabry's urgency and feverish mark-making also aligns with artists such as Franz West or Isa Genzken. Perhaps uniquely in the ceramic medium, her work is the physical embodiment of a studio process in continual play, where risk is an uncalculated imperative. I make painterly, abstract, ceramic objects. Primarily my work communicates directly through its formal and aesthetic qualities, but it may also be understood in relationship to abstract painting and process art. Sometimes the surfaces look weathered and aged, but at the same time flow with lush, wet color. There is a sense of immediacy to the mark making, and at moments a quality of action. I exploit the intrinsic qualities of ceramic materials and glazes to produce work that is seductive and surprising. Ultimately, my work is a synthesis of intuitive, expressive surfaces and elemental forms. Originally from Madison, Wisconsin, Lauren Mabry is currently living and working as a studio artist in Philadelphia, Pennsylvania as a long-term resident at The Clay Studio. Mabry holds her BFA in ceramics from Kansas City Art Institute (2007) and her MFA in ceramics from the University of Nebraska-Lincoln (2012). Her work is in the permanent collections of the Nerman Museum of Contemporary Art (KS), The Sheldon Museum of Art (NE), and The Archie Bray Foundation for Ceramic Arts (MT). 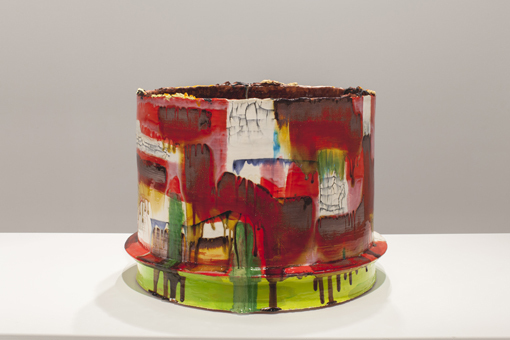 Using ceramics as a means to communicate, her work focuses on painting, form, and materiality.